For the fourth-consecutive year, Xiaohong Liu has made Clarivade Analytics’ (formerly Thomas Reuters) list as one of the world’s most highly cited researchers in the field of geosciences. 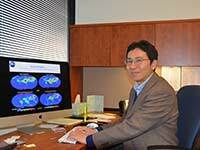 Liu, a UW professor in the Department of Atmospheric Science and the Wyoming Excellence Chair in Climate Science, was listed in the prestigious Clarivade Analytics’ Highly Cited Researchers 2017. Highly Cited Researchers 2017 represents some of the world’s most influential scientific minds from 21 scientific fields. More than 3,300 researchers earned this distinction by writing the greatest number of reports officially designated by Essential Science Indicators as “Highly Cited Papers” -- ranking among the top 1 percent most cited for their subject field and year of publication (2005-2015). Only articles and reviews in science and social sciences journals indexed in the Web of Science were considered. Liu has received numerous awards and honors, including Pacific Northwest National Laboratory’s Exceptional Contribution Program Award and Outstanding Performance Award; the World Meteorological Society’s Young Scientist Award and its Mariolopoulos-Kanaginis Award (honorable mention) for papers in atmospheric environmental research; the Alexander von Humboldt Research Fellow at Fraunhofer Institute for Atmospheric Environmental Research, Garmisch-Partenkirchen, Germany; and was elected into the “100 Talent Program” of the Chinese Academy of Sciences. Liu also heads up a research project where he uses the National Center for Atmospheric Research (NCAR)-Wyoming Supercomputing Center (NWSC) in Cheyenne. His project goal is to better understand the role of black carbon emitted by wildfires and mineral dust lofted into the atmosphere from arid regions on precipitation, snowpack and climate variation in the Rocky Mountains. This will ultimately lead to better climate prediction capabilities. Liu also is a major developer of aerosol and aerosol-cloud interaction schemes in NCAR’s Earth System Model. He edits the journal Atmospheric Chemistry and Physics, and the Journal of Meteorological Research. He has served as a guest professor at the Institute of Atmospheric Physics at the Chinese Academy of Sciences in Beijing, China, and Nanjing University in China, where he advises doctoral students. Find out more information about Liu.